This recipe is for an Italian Biscuit Cookie or as my husband likes to call the " Dream Cookie." You may be wondering why he calls these cookies the "Dream Cookie"? These cookies are so good you feel like you are in a dream? 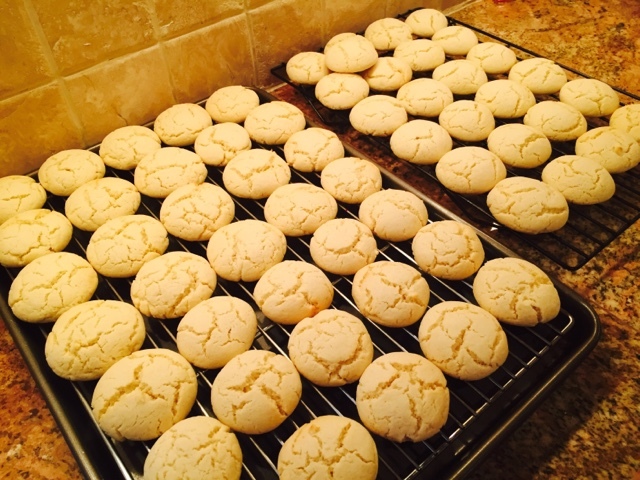 The sugar, butter and almond flavoring combine together and literately melt in your mouth. Add the buttery & creamy icing to the top and you feel like you have died and gone to heaven!!!! I found these biscuits on Pinterest and they were called "Spring Biscuit Cookies". Let me tell you....you can make these cookies in the spring, you can make them in the summer, you can make them in the fall, you can make them for Easter, Christmas, Birthdays....etc....No matter when you make them or where you bring them I promise you they will be gone, gone, gone! I have made them for Easter & Mother's Day and I tinted the frosting pastel colors or left them plain white and sprinkled pastel sugars on them. 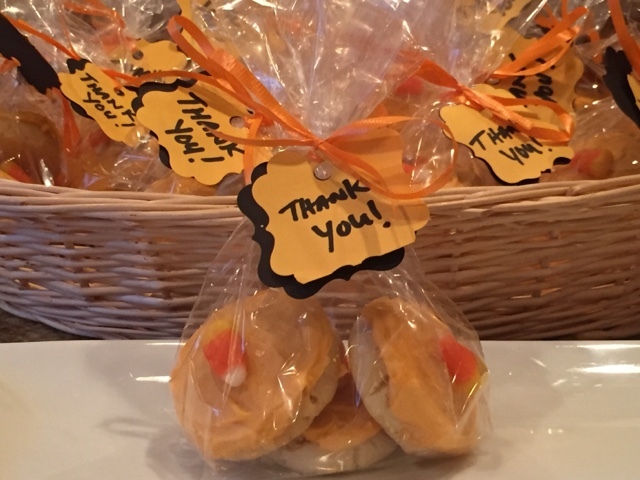 This time around I made them for a trick-or-treat broker open house (yes, we are trying to sell our home). 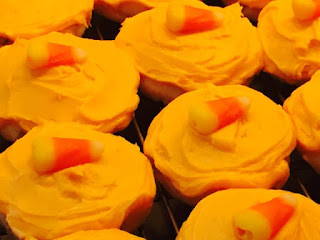 As you will see I tinted the frosting a light orange, placed a candy corn in the middle and wrapped them up as a "thank you" goody bag. 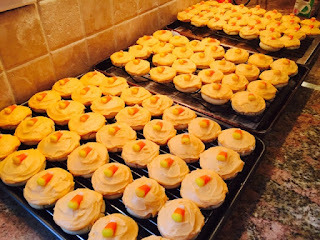 I doubled the recipe and brought some over to a friends house as a gift for Halloween and brought extras to my parents Halloween party. Make these cookies once and you will make them again, and again, and again! People will request you bring these to their parties! These are the types of cookies you will not be able to eat just one. You eat one and then you just keep eyeing the platter of cookies and sooner rather than later you just go ahead and grab another...because they are just that good! Believe me..or rather believe me husband when he says these truly are a "Dream" Cookie! 2 . In a large bowl beat butter and sugar until smooth and creamy. 3 . Add eggs one at a time to butter mixture; beating well after each egg. 4. Add vanilla and almond extracts and vegie oil and mix well. 5. In a medium bowl mix self rising flour and baking powder together with a whisk. 6. Add flour mixture to butter/sugar mixture and beat until well mixed. 7. Line baking sheets with parchment paper. slightly with the palm of your hand. 9. Bake for about 10 minutes until cookies are still soft to the touch but slightly golden on top. cooling rack until completely cool. 11. Once cool frost cookies. 1. In large bowl beat together powdered sugar and butter until light and creamy. 2. Add vanilla extract, almond extract and milk. Beat until combined, creamy and fluffy.